In the wake of the attacks in Brussels on Tuesday morning, the famous statue the Manneken-Pis has become a powerful image of defiance: Over social media, artists and cartoonists have been sharing reimaginings of the statue doing what it does best all over the symbols of fear that have rocked the city. Even if you don't know the name, odds are you know the statue: It's the one depicting a little boy urinating into a fountain. Located at the junction of Rue de l'Etuve/Stoofstraat and Rue du Chene/Eikstraat, the statue, which was created by sculptor Jérôme Duquesnoy the Elder and cast in bronze, has been standing in its current form since the 17th century; however, the original version dates back to the 15th century. A female counterpart, the Jeanneke Pis, was commissioned in 1985 and erected south of the Grand Place in 1987. 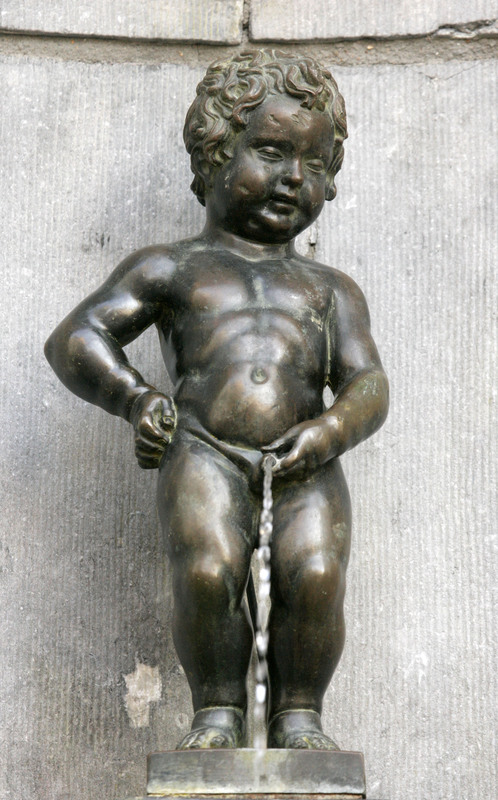 Although the Manneken-Pis (literally "little man pee" in Dutch) did originally serve a purpose — according to the City of Brussels website, it "played an essential role in the former distribution of drinking water" — it's no longer in use for that reason; however, it has become "an image and symbol of the Brussels folklore, the joy of the inhabitants, and their capacity of [sic] self-mockery." It's dressed up several times a year; apparently, its wardrobe is quite expansive, consisting of several hundred different costumes. Of course, the question always remains: Why a little boy peeing? Many stories exist purporting to explain the inspiration for the statue. In one, the infant Duke Godfrey III of Leuven defeated an army of enemy troops in 1142 by peeing on them; in another, a little boy in the 14th century discovered a plot to break down the city walls with explosives and saved Brussels by urinating on the burning fuses; and in two others, little boys went missing, causing their parents to go into a panic, only to be found later, safe and sound and urinating in an area near where the fountain is now. None of these stories have been definitively proven; however, they remain a distinct part of the lore surrounding the Manneken-Pis — and they're also part of the statue's charm. Given what the Manneken-Pis has come to stand for over the centuries, then, it's fitting that today, artists are depicting it urinating on explosive devices and guns. The message it sends is, we will not be cowed by these attacks. We will stand tall. Literally, we piss on your fear. People are also leaving white tulips at the Manneken-Pis' fountain in honor of those who perished in the attacks.